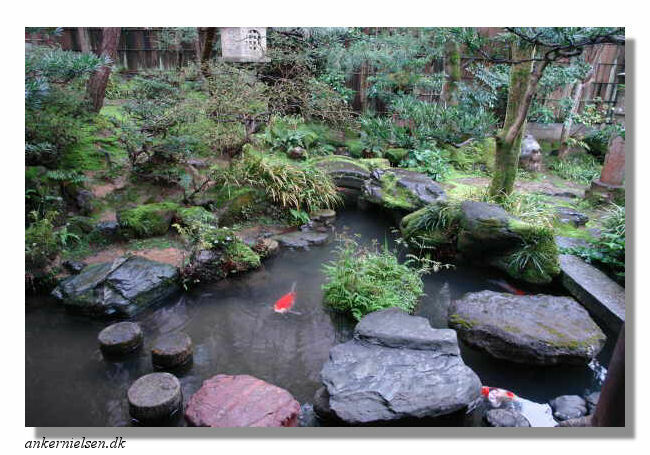 The first time I learned about the Samurai residences (and) gardens of Chiran ( 知覧武家屋敷群 ) was in 2008 when I discovered the superb Internet photo collection of Japanese gardens from Professor Anker Nielsen. Around that time there also was a forum post about samurai gardens in Kanazawa: Samurai Quarter in Kanazawa/Japan by Gunther Schulz, with some more photo's on the subject. Although now beyond imagination, I then almost forgot about them. After having studied lots of (monochrome) ink-paintings from China and Japan, I was again drawn to these gardens and intrigued by them, as they seemed to be the closest ever three-dimensional projections of these ink-paintings, of all gardens I have seen. To my surprise I have not seen rave reviews and only very few references to these exceptional gardens. 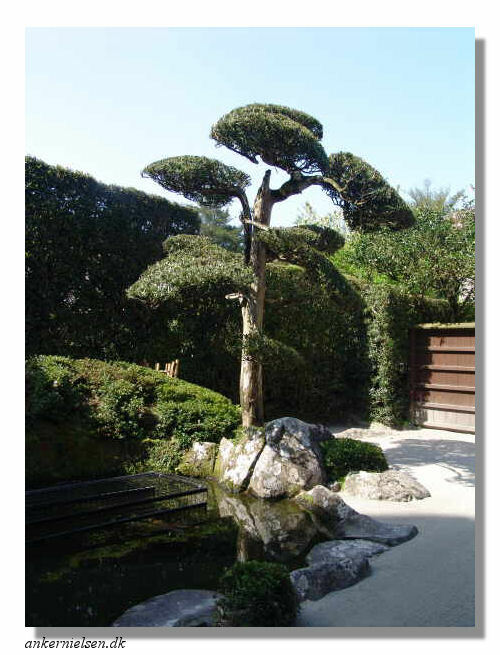 For instance the book Japanese Garden II [ 6 ] by Haruzo Ohashi includes one photo of Mr. Naotada Sata's garden. The gardens we have visited in central Japan, in Kyoto, Nara, Niko were world famous, often visited by throngs, and splendidly photographed in dozens of books. On the Internet and World Wide Web tons of information and many magnificent photo's can be found of most of these gardens, yet the Samurai Gardens of Chiran are poorly represented. 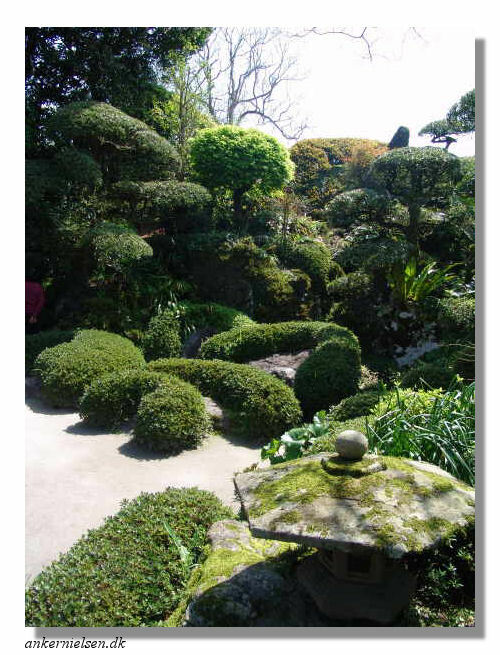 In a short paragraph in one of my older guide books [C] (still a great resource) I found some information and even a small photo of one of the gardens. After my Mount Sumeru erected after 10 year of "dormancy" adventure (see: Stone and rock: Mount Sumeru) I became even more intrigued by the use of ink-paintings to create a karesansui garden and decided to dive into this. And that has been the trigger for this chapter. 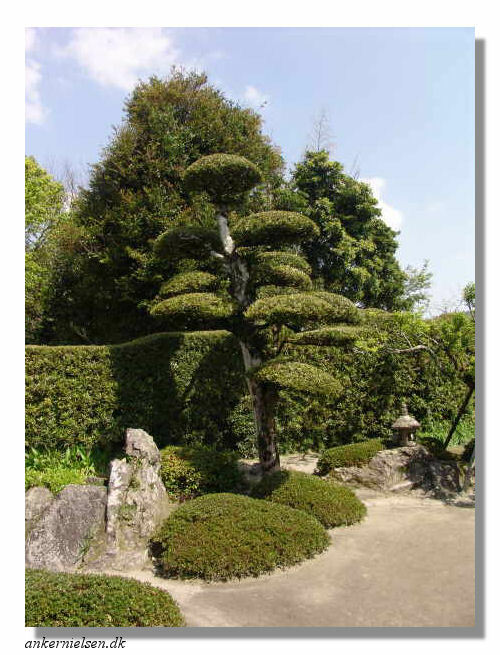 Our conclusions are documented in Study into the origins of the Samurai gardens, at the bottom of this page. Zen - serene, contemplative, a discipline of meditation associated with painting, rock gardens, and flower arranging - seems an odd ingredient in the martial psyche of the Japanese Samurai. Winston King, "Zen and the Way of the Sword". Chiran, Chiran-cho, was a town located in the Kawanabe District, Kagoshima prefecture on the island of Kyushu, Japan. On December 1, 2007, the town ceased to exist as an autonomous entity after it merged with neighbouring municipalities, Ei and Kawanabe to form Minamikyushu. On June 16,1975 a "Preservation Society" was inaugurated to assure garden preservation and restoration. 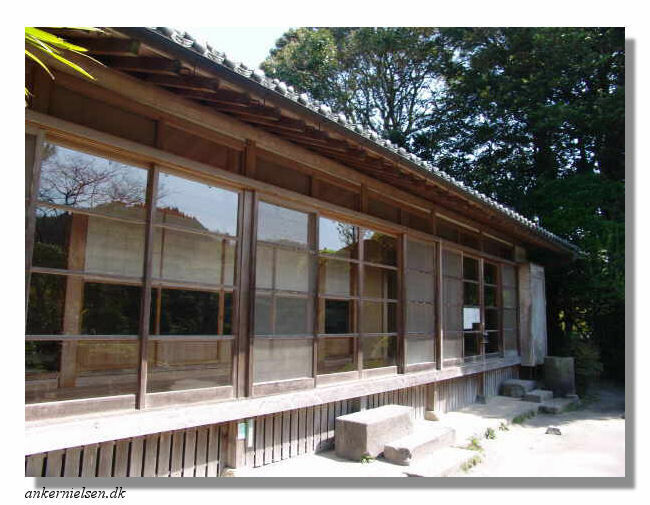 In April 2007 the supervision of the gardens was brought under the "Chiran Bukeyashiki Teien Hozonkai" or "Chiran Samurai Residence and Garden Preservation Association" (referenced CBTK). The Kagoshima Prefecture (Kagoshima-ken) is located at the southwest tip of Kyushu Island and includes a chain of islands stretching further to the southwest for a few hundred kilometer. The capital is the city of Kagoshima. Chiran lies in a broad valley. It is an idyllic little town with something of the atmosphere of a large village, renowned for its old gardens, its excellent tea, and the Koi that swim in the gutters. Chiran owes its fortune to the Shimazu lords of Kagoshima. In the seventeenth and eighteenth century, the Shimazu's chief retainers, the Sata family, were permitted to build a semi-fortified village and a number of their lovely samurai [D] houses survive today. The world of the samurai as the legendary elite warrior cult of old Japan, has long been associated solely with military history and has remained a mystery to the general reader. This book goes beyond the battlefield to paint a picture of the samurai as they really were. The book explores the samurai within the context of an all-encompassing warrior culture that was expressed through art and poetry as much as through violence. Using themed chapters, it illuminates the samurai through their historical development and their relationship to the world around them, relationships that are shown to persist in Japan even today. 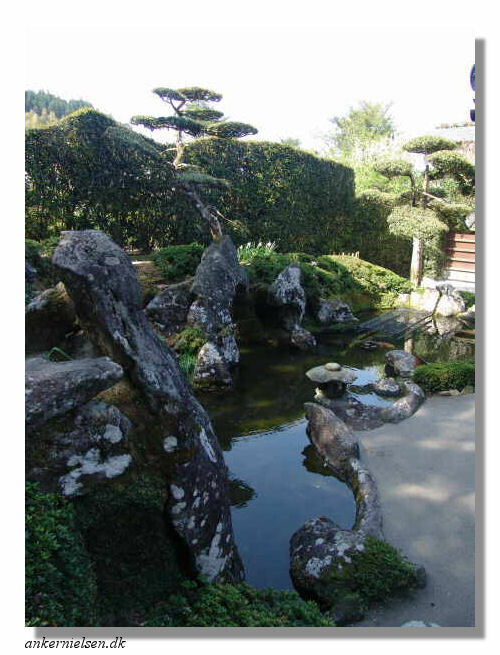 Note that it only includes one (page-size) photo (the Hirayama Katsumi garden) and a short paragraph dedicated to the gardens of Chiran. Central Chiran consists of one main road oriented roughly east-west. A treet of old samurai residences and gardens built in the later part of the Edo Period (1603 - 1867) runs parallel to the south of this road. The samurai houses, buké-yashiki, are grouped along this attractive lane and seem steeped in the atmosphere of the age. Behind ancient stone walls topped by neatly clipped hedges lay seven of the gardens, laid out on a grid plan, that are open to public. Recently they have been designated, by the national government, as places of scenic beauty. The town of Chiran lies in south-western Kyushu, some 30 km (19 miles) south of Kagoshima, chief town of the prefecture. It is surrounded by enchantingly beautiful hills covered with extensive tea plantations. During the Edo period it was one of the 102 castle towns on the borders of the province of Satsuma. On the outskirts of the town is a former airfield where the kamikaze suicide bombers were based during the Second World War. In the Second World War it was a military air base, with a flying school. The site has now been turned into the "Special Attack Force Peace Hall" museum, documenting the history of the kamikaze and commemorating the hundreds of young pilots who died during the Second World War. During the Edo period, Chiran was part of the Satsuma han one of 102 castle towns, dotting the kingdom of the powerful Shimazu family clan, rulers of southern Kyushu for no less than twentynine generations (695 years). Like all feudal lords in Japan, the Shimazu's were required to travel to Edo (now Tokyo) every two years. Not only did these trips take a lot of time, but they were also costly, which was all part of the shogun’s simple but brilliant plan to keep military rebellion under control. To accompany them on their long laborious journeys, the Shimazus employed the military services of samurai retainers on loan from Chiran. For such rural samurai these were the journeys of a lifetime, with exposure to the richeness of Kyoto and Edo. A journey of a lifetime to experience the cultural richness of Kyoto and Edo. The experience made them more sophisticated and gave them a love for literature and the military arts. It where these men that consolidated the new administrative system, constructed orderly roads and built stone walls around their simple compounds. It where these man that also invited gardeners to Chiran to construct a series of relatively small gardens on their modest estates surrounding the castle. The island Kyushu in the very south of the main island. A close up of Kyushu. Chiran is located in the upper part of the dark-green region. This flyer shows the major attractions of Chiran: The kamikaze museum, the samurai gardens and the tea plantations. Following, a brief prelude to the beautiful samurai gardens of Chiran. Chiran, a small town lying in a broad valley. Right on entrance there is a lot to see for "garden lovers". An extraordinary combination of (garden) objects along a street in Chiran. as the eye can see in either direction. It is neither fenced nor covered. Can you imagine that ? This "gutter" teems with 1/2 kilogram to 1 1/2 or 2 kg (one- to three-pound) koi with a variety of colors and mosaics as they swim against the current. in admiration as it now forces every visitor to stop. It is beyond imagination that something as this could just even survive in most Western countries. During the Tokugawa Period the Shimazu of Satsuma allowed their vassals, the Sata family from Chiran, to take up tea cultivation, that prospers ever since. The venture proved to be a great success and the financial results of their enterprise may be seen in the houses and gardens of Chiran that where laid out during the Edo Era (1603-1867). (CBTH) It is believed that these Samurai residences were created during the reign of Shimadzu Hisatatsu (1651-1719) or Shimadzu Hisamine (1732-1772). The heads of the Chiran Shimadzu Family and their retainers were highly educated people and enjoyed Japanese waka poems and calligraphy. It is also said that they visited Kyoto and brought Kyoto culture back to Chiran. In addition, the Satsuma Clan introduced Chinese culture through trade with China by way of Ryukyu (present day Okinawa), which was indirectly under the control of the Satsuma Clan. One such influence can be seen in the gardens of the Chiran Samurai Residences. The gardens there are precious evidence that cause us to realize that Chinese gardening culture was introduced to Japan by way of Ryukyu. Note: This is a statement in "Samurai: The World of the Warrior". Having seen the gardens this is hard to believe. We are going to validate this statement. 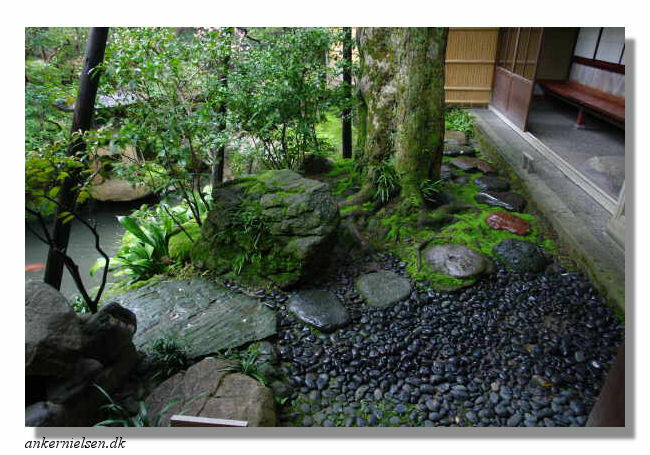 "The gardens themselves are reminiscent of the courtyard gardens of Kyoto,..." [D]. "Just as Chiran was the little brother to Kogoshima, so each garden is an echo in miniature of the magnificent garden (Iso Tei-en) of the Shimazu daimyo that lies in the han capital itself. "The gardens of Chiran are influenced by the gardens of Kyoto (Kyoto-style is "humble simplicity") and the Ryukyu Islands (now Okinawa) culture. The origin may also lay in China that is not far distant." By a strange coincidence, China's Konani Fukuken prefecture, Kanton prefecture, Taiwan and Okinawa were especially rich areas for "funshi" winds and water belief. This is thought to been the case since these areas are, comparatively speaking, quite blessed by an abundance of wind and sunshine. However, "fusui" is not just the science of winds and water. Along with the teachings of Taoism, from which it originated, fusui had an immeasurably huge influence on the culture of Okinawa. For instance, the customs of Sisa, Hinpun, Hinukan, Simi, the patron saint of Itoman Hare, Uchikabi, Faizai etc., are all based in Taoism. From the 15th century, spanning over 150 years, the Ryukyu Kingdom's tribute fleet, which numberedover 400 ships traversed the East China Sea, carrying tributes to China and engaging in trade with South East Asian countries. Also see: "Links related to this subject". 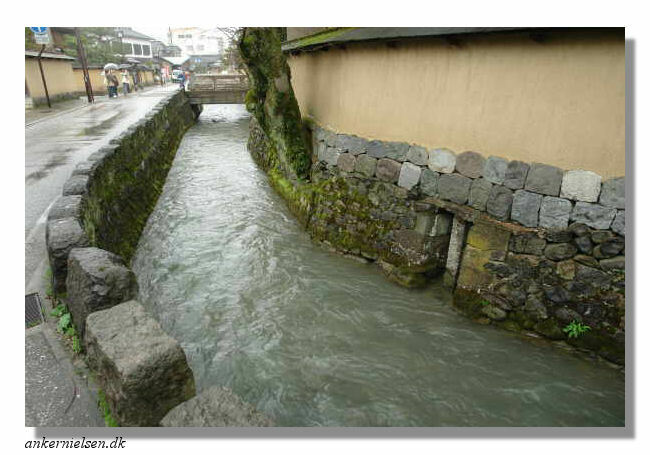 The stones are tuff-stone (compacted volcanic ash) brought from a depot upstream the Fumoto river. These stones were cut from the tuffbed, cleaved into smaller pieces along the grain and carried on the back of cattle. Note: In this book there is mentioning of six gardens, all with different names then those seen today (2009). About the middle of the 18th c. Shimazu Hisamine (1732-1772), Castellan of Chiran, visited Kyoto, then capital of Japan, and was so impressed by the beauty of the gardens there that he invited gardeners to come to Chiran and caused them to lay out a series of beautiful dry gardens (karesansui) on plots of land carved out of the estates of the samurai. To give an impression of the Iso Tei-en, Kagoshima city, we included some photo's. This garden, the Sengan-en ( ä»™åŽ³åœ’ ), Iso Tei-en (ç£¯åº­åœ’), and the villa that lies beside it, was laid out in 1660 for the Shimazu family after Tsurumaru castle was destroyed in the Satsuma Rebellion. But where the gardens of Chiran borrow their scenery from the hills beyond, the Iso Tei-en goes one better and uses the spectacular view of the volcano of Sakurajima, sitting out there in the middle of the bay. The samurai quarter is a semi-fortified village of which a number of houses survive today. Nowadays this old samurai quarter, with as its center the "Honbaba promenade" or Bukeyashiki-doori (æ­¦å®¶å±‹æ•·é€šã‚Š), "the street with old samurai residences", or "samurai lane" of Chiran, narrow paved lanes bordered on both sides by walls of undressed stones covered with moss and lichen, still represents the peaceful days of the Tokugawa regime. Most of the gardens date from the mid- to late 18th century. They are shut off fromthe street and lay within the stone walls topped by thick, clipped hedges. The walls were originally designed with defensive purposes in mind, as were the stone barricades at the entrances that would stop an enemy charging through the gateway. Map to locate the seven samurai gardens in the samurai quarter of Chiran. Since many of the samurai houses are still occupied, you can't see inside, but the main interest lies in their small but intriguing gardens, some said to be the work of designers brought from Kyoto, hence the qualification "Little Kyoto in Satsuma" is also used. Seven gardens, indicated by signs in English, are open to the public. Though each is different in its composition six of them are karesansui gardens and only use sand, rock groupings and shrubs to represent a classic scene of sea, mountains, valleys and waterfalls, probably (see later) taken from (Chinese ?) landscape ink-paintings. One garden, Mori Shigemitsu, is a tsukiyama garden with a pond. In some of them the design uses the shakkei technique to incorporate the hills behind as "borrowed scenery". The garden or residence names are not consistently translated or used. Those used in the list below are the English names found on the nameplates at the main entrance of the gardens. What is unambiguous are the assigned numbers that we have seen assigned consistently on a number of maps and flyers. Note: The slide-show will only display correctly after this page has fully loaded ! Next we go into more detail on each of the seven gardens open to the public and that are shown on this Chiran overview-flyer. Also known as Mr.Satoshi Itirou's Nishigou garden. Mr. Satoshi Itirou has move and no longer lives in this prefecture. The residence now belongs to the city of Chiran. with a relatively large (sand-)"sea" in front. In the Japanese CBTH it is stated that the stone arrangement in the south-east corner forms a dry	waterfall and represents a mountain peak. The meticulously clipped Podocarpus shrubs behind the prominent central stone setting represent the undelation of far distant mountain ranges. The "sea" in front is not raked and not composed of gravel but rather sand and clay (local soil ?). Another name for this garden "Garden of Crane and Tortoise" comes from the tall stone in the arrangement that looks like a crane and the tortoise-shaped stones scattered about as if real tortoises were idling around along the mountain stream flowing into the ocean. Here a nice amateur video-clip. It gives a good impression of the garden of Saigo Keichiro. With thanks to the author Eva Baum. a relatively large (sand-)"sea" in front and "borrowed scenery" in the backdrop. This garden "incorporates" borrowed vista's from the natural scenery (by means of a technique named Shakkei ) of the Hahagatake mountain range. The stone arrangement with a dominant peak that stands in the north corner. The curved shrubs of Podocarpus form a layer between this peak and the Hahagatake mountain range that form a fluent distant backdrop. with a relatively large (sand-)"sea" in front and intriguing "borrowed scenery". On entering the main gate you see the Byobu-iwa. The presence of a Byobu-iwa lends dignity to the owner and estate that was typical of the samurai residence in the middle Edo period. This garden has no stone arrangement but it does have a row of stone poles that we have not seen explained. The trimmed shrubs are pruned in such a way that they make two layers of mountain ranges, with risin peaks in the second layer (Podocarpus). The layer in the front is a large Azalea O-karikomi (see: The main garden O-karikomi) that looks like an artificial hill (see: Tsukiyama). This landscape garden is the most simple, or perhaps better abstract, of the seven and makes optimal use of scenery borrowed from the Hahagatake mountain range. Type Karesansui landscape with large stones, topiary shrubs. lots of trees and complex shapes and combinations of e.g shrubs and stone and ornaments, with a spacious and relatively large (sand-)"sea" in front. The stone arrangement has a dry waterfall, a stone lantern placed on the top of an artificial hill and a number of arrangements of huge rocks on the flat plane below. The largest stone has an almost triangular shape. This seams to be the most impressive illusion of natural space. In my old guide book [C] it is stated that racked sand is used. We yet have to find out if this has been the case in the past. topiary shrubs, lots of trees and Wisteria and ornaments. with again a relatively large (sand-)"sea" in front. What strikes the eye is the huge pagoda that is even higher then the highest stone where it stands next to or actually visually on. This highest stone on its turn has an interestingly bend top. with a relatively large (sand-)"sea" in front and borrowed scenery. After entering the main gate you are confronted with a cut stone wall, called Byobu-iwa, that shields the house and garden. The garden incorporates scenery borrowed from the Hahagatake mountain range. In one corner of the garden, there is an artificial hill in the middle of which soars a prominent 3 1/2 meter (11 feet) high oblong stone. At the foot of this arrangement is a "dry waterfall". (CBTK) The garden has the air of ancient China and makes visitors feel as if they were standing in front of an exquisitely drawn Chinese ink painting. with a relatively large (sand-)"sea" surrounding the pond and tsukiyama. (CBTK) The Mori family was one of the most important among the vassals of the Shimadzu clan. 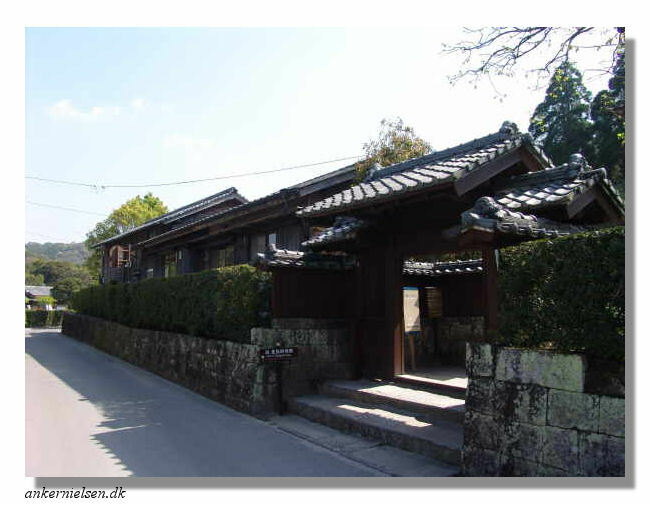 The dwellinghouse and storehouse were built in 1741, on the western outskirt of Kikko-jo Castle, and have been fully preserved. The pond has a meandering borderline on the near bank. This bank is decorated with strangely shaped rocks and stones, which are arranged in ways that lead you to an imaginary landscape with a nearby mountain and a peninsula. On the opposite bank is a hollowed stone that looks like a cave and symbolizes the flow of water in nature. Inside the entrance on the right side is a stone, the most important element of the garden, that represents a remote mountaintop rising above clouds. This is the end of the Chiran samurai gardens chapter. 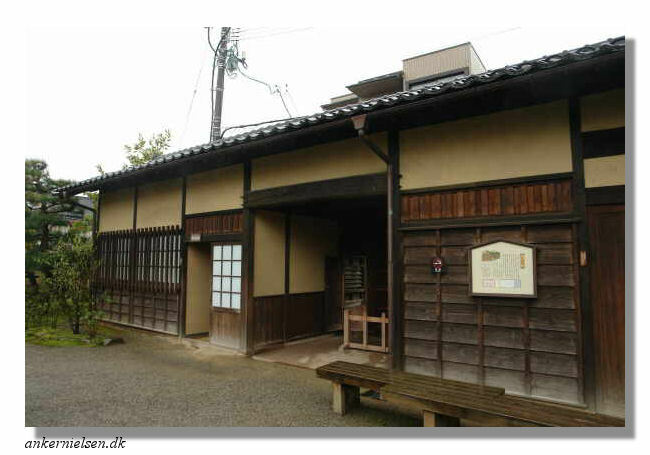 We also found one samurai residence in Shiroishi city, Miyagi Prefecture, of which we studied the garden. Most of the text below was taken from the "official" website of the city of Shiroishi, Miyagi Prefecture, and the Koseki Samurai Residence. Note: Reading this let us believe that there could be a connection and if so, whether that applies also to the garden. To be investigated. Old samurai residences remain in the residential area facing the stream of the outer moat of the castle, the Sawabata River, in Shiroishi City, Miyagi Prefecture. The neighborhood of the residences was the place where middle-class samurai lived in the Edo period (1603-1868). Shiroishi developed as a castle town at the foot of Shiroishi Castle, which was resided by the Katakura clan, one of the retainers of the Date clan. The castle was dismantled after the Meiji Restoration. One of these middle-class samurai was Koseki. 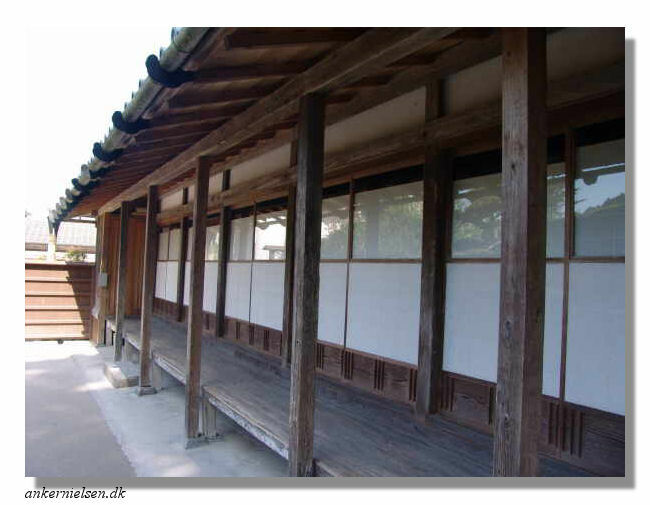 Historical documents indicate that the Samurai Koseki Residence was constructed in 1730. The first of the Samurai Koseki Family to live here was a vassal to Lord Katakura. 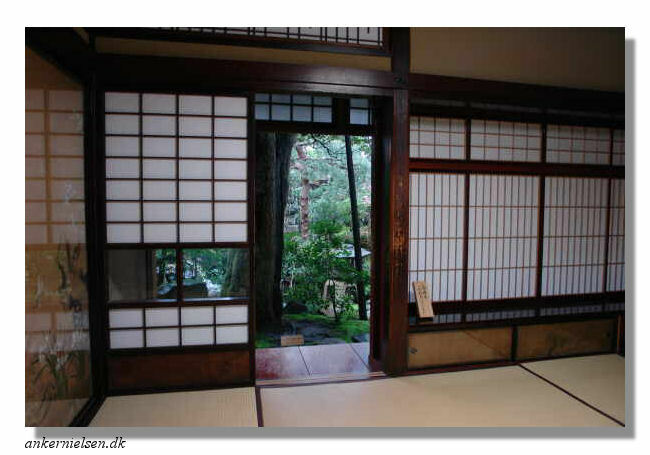 In 1992, the Koseki House was generously donated to the City of Shiroishi. The city then restored the construction to its original state and opened the house to the public. The house is simple in design, having a traditional three-room floor plan. 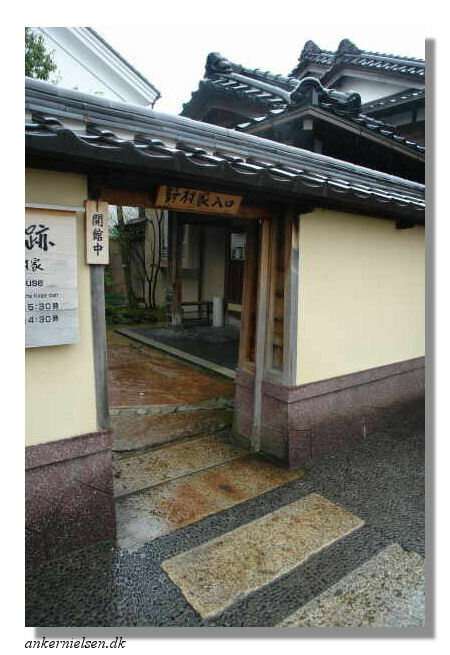 Originally, the house was constructed as a farmers house, but was later renovated to befit member of the Samurai class. Cross the old clay bridge, through the humble gate, and enter the house with the thatched roof. A visit to the house and gardens will make you feel as if you have stepped back in time to the Edo period (1600-1867). We also see æ­¦å®¶å±‹æ•·é€šã‚Šã€€ Bukeyashiki-doori, The Street with Old Samurai Residences. Kanazawa city in the Ishikawa prefecture, has a samurai area in the Naga-machi district named "Naga-machi Buke Yashiki District". 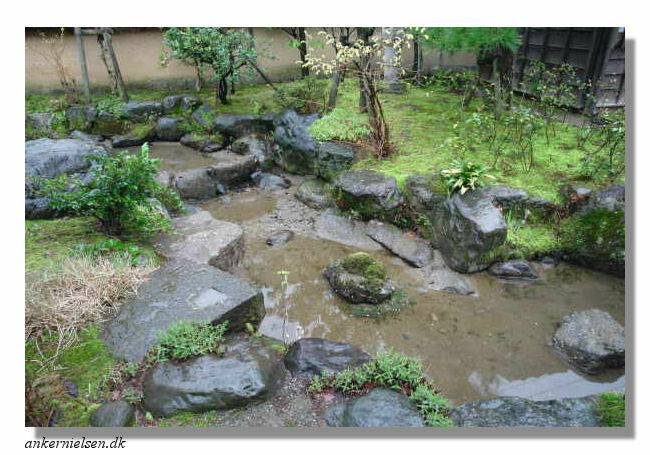 We will have a closer look into the gardens to see if we find any resemblance with the Chiran (karesansui) gardens. We have found two traditional samurai residencies with gardens open to the public. The atmosphere of Kanazawa of the feudal times still lingers in this area where old houses lined the streets that once belonged to Kaga Clan Samurais. The T-shaped and L-shaped alleys are distinct characteristics of the feudal town, and the mud doors and gates of the houses remains the same as they were 400 years ago. One can definitely imagine how the town was like from the different structures, such as the houses with samurai windows, and the mud walls under the yellow Kobaita wooden roofs. The straw mats "Komo" that protect the mud walls from snow gives out the real feeling of winter in Kanazawa. Inside the Nagamachi area, one can also visit the Ashigaru Shiryokan, which was a house that belonged to a soldier in the Kaga Clan. The Nomura Samurai Family Residence is also open to the public so visitors can get a feel of what a Samurai's daily lives were like during the feudal times. 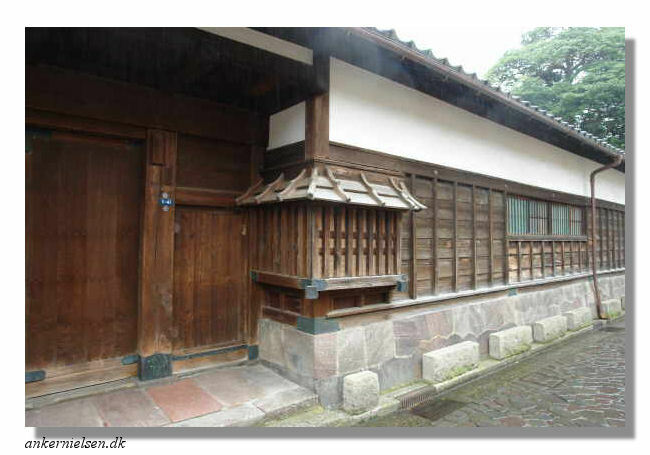 These are the "Takada Family Remains" and the "Nomura Samurai Family Residence". (KTIG) The nagayamon gate (row house gate) of the Takadas, a middle-class samurai family, has been open to public since it was restored. The nagayamon gate incorporates a servant room and stable. Visitors will know the roles of middle-class samurais and their servants and lives in those days. The garden having the pond in round-the-pond style with water taken from the Onosho canal is one of the highlights of the remains. The garden inside the Nomura Residence has trees over 400 years old as well as various lanterns. A very brief impression Nomura Residence website (japanese). A few permanent Samurai homes can still be seen in the castle town of Kakunodate in the Akita Prefecture. For an impression of these houses please click the above links to Jcastle.info, Guide to Japanese Castles. A few permanent Samurai residences remain in Sakura, Chiba Prefecture. 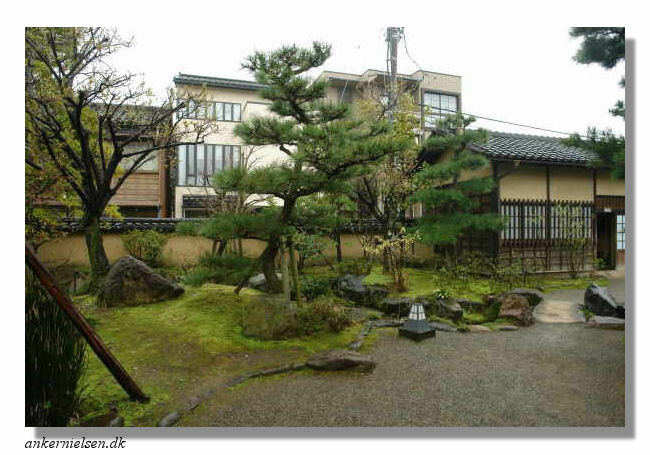 Chiran Bukeyashiki Teien Hozonkai (CBTK) or "Chiran Samurai Residence and Garden Preservation Association". We discovered this site rather late otherwise we would have included less of the general information that is available on these pages. Mystery & Romance of Ryukyu History. Winds, Waters & the Ryukyu Kingdom. By Mr. Yasushi Kameshima. Former Residence of Samurai Koseki. 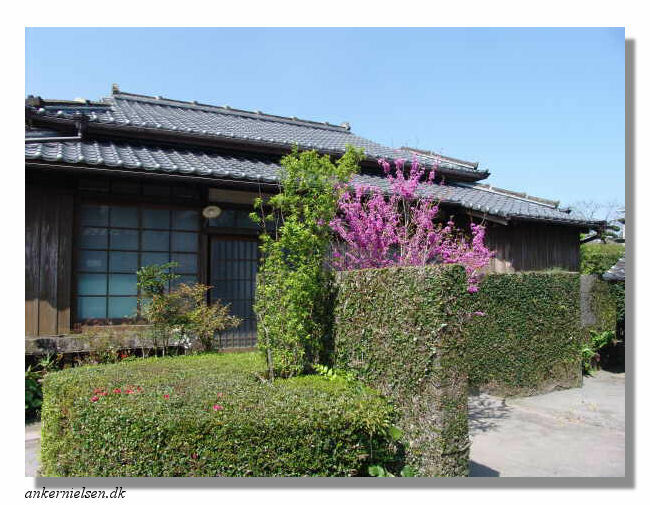 Nagamachi Samurai Houses and Nomura Residence website. Kanazawa Tourist Information Guide (KTIG). A few permanent Samurai homes can still be seen in the castle town of Kakunodate in the Akita Prefecture and in Sakura , Chiba Prefecture. Critical Perspectives on Classicism in Japanese Painting, 1600-1700. By Elizabeth Lillehoj. University of Hawaii Press (2004) ISBN 082482699X, 9780824826994. Jcastle.info: Guide to Japanese Castles, Samurai Homes. The Samurai Archives Japanese History Page. 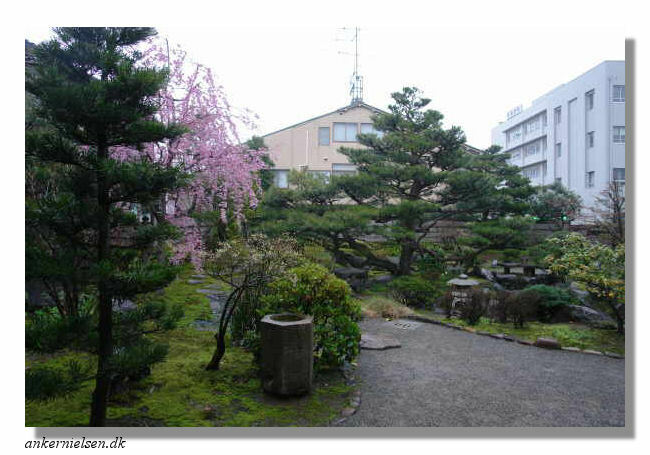 Seeing the similarities of most of the Chiran samurai gardens we where intrigued to know the origins of these gardens. 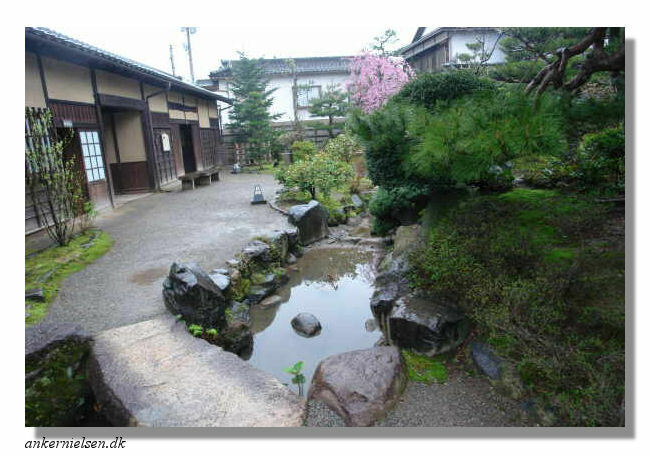 While we where searching for information we found some other samurai residencies and gardens, which raised the connection if there is any resemblance and if there are connections between them. The following is a list of questions that we wanted to get answerred. What are the differentiating characteristics that make these gardens exceptional ? What is the origin and source of the landscape scenes in the Chiran Samurai gardens ? Who designed and built them ? Can they be characterized as hourai youshiki, Lit. Penglai style. A type of garden in which the representation of Mt. Penglai (Houraisan) is one feature. Or even as hourai teien, Lit. Penglai garden. A general term for a garden focused thematically on Mt. Penglai. Does this explain the similarities in the garden ? Do comparable Samurai gardens exist outside of Chiran ? Sub-question: If so are the design origins visually recognizable and connected. What is most stricking is the way these gardens present themselves and show resemblance to viewing a (monochrome) ink-painting. From the sand adjacent to the house, I gazed upon miniaturized symbolic coastlines sculpted from small shrubs, dwarfed trees, and stone lanterns. Behind many of them were clusters of rock pinnacles, part way up man made hills. On one such hill, a small stone path wound its way up to a pagoda. For a moment, I thought I saw tiny saffron cloaked monks climbing the path. The flash of color and motion was from a butterfly. Along the top of the hill, bolder, larger shaped trees and bushes simulated a nearby mountain range. The staccato song of a gray wagtail pierced the silence. The proud bird perched on a high branch, yellow breast inflated under its gray morning coat. Beyond it, a real mountain range could be seen in the distance. Lenny Karpman, Samurai in the Garden (travelers' tales). 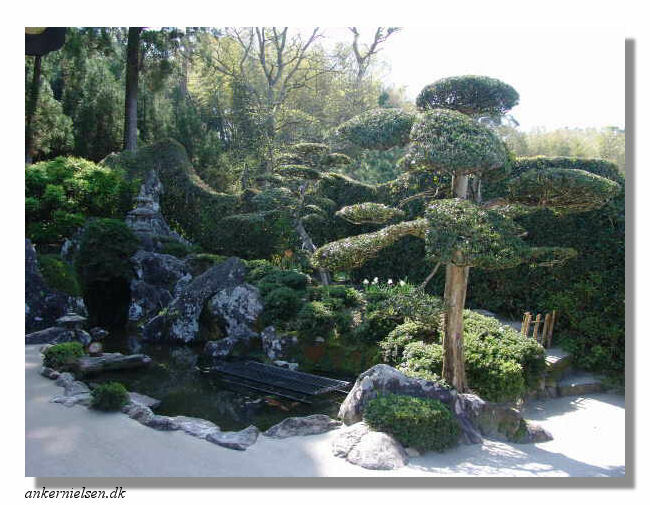 These gardens seem almost extremely faitful to the design principles of the Sakuteiki ( 5 in [1, 2]) and to the concept of layering in Chinese painting technique's. This however, was already applied during to the Muromachi period. The gardens of the Muromachi era are thus three times removed from nature . Firstly, because they are "constructed" like a landscape painting. Secondly, because they are designed to be seen statically and from a distance. Thirdly, because they offer an increasingly monochromematic representation of nature, as found in Chinese landscape painting. For more information about the 3-D ink-painting technique, see: Stone and rock: Mount Sumeru. For characteristics see Karesansui (long) definition. None of the gardens use gravel to represent lakes or sea. All gardens have sand, or probably native soil instead. That we have not been able to determine for 100 percent. We have none of the sand areas seen raked. Out of the seven gardens there is one that shows least resemblance with the other six landscape scenes. That is the number 3, Hirayama Ryouiti, that basically has no stone settings but uses only O-Karikomi clipped shrubs. This garden has neither stone arangements nor stone lanterns. One could argue if the stone poles should be regarded as stone settings. In fact they can. But even then, these show no resemblance to the other gardens stone- settings. An other eye catching observation is the fact that six out of seven gardens are dry gardens, karesansui, and only one has a real water pool and sand. This is the number 7, Mori Shigemitsu's garden. The main stone setting in this garden is as prominent and shows the same characteristics as those in the other gardens. From Mr. Kyoko Sata, President of the Cultural Division of Chiran, we got the following possible explanation for this. As you know, only Mori Shigemitsu's garden has a pond which even today makes use of natural water flowing from the adjacent hill covered with thick cedar trees. But it is possile that there were other gardens with ponds in the early period. The choice between "pond" and "dry" depended on the geological features of the land. The six dry gardens are arranged along the old Samurai Street a bit distant from the near-by hills where it might have been difficult for civil engineers to draw water. The large stones that are used often have extraordinary shapes and "ask for attention". 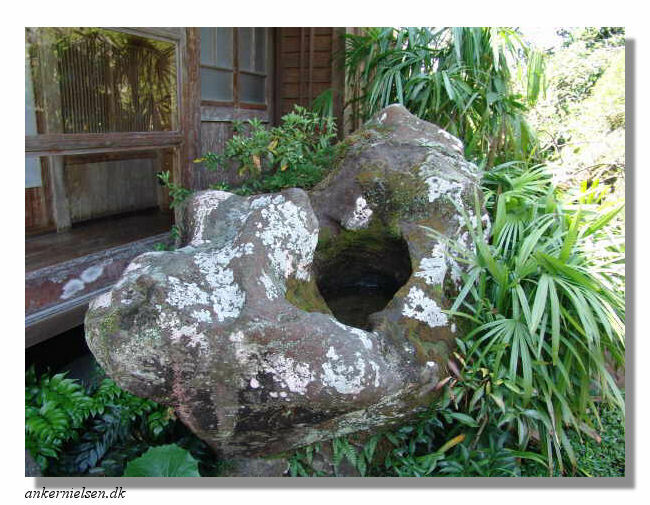 As an example the central stone in number 6, Sata Naotada, has an oblong shape and soars a prominent 3 1/2 meter (11 feet) high. The gardens seem a little cluttered at first. They are small, varying between 63 and 135 å�ª, tsubo, the largest being an exception. In a typical Chiran garden an entire landscape scene can be depicted in a rectangular plot no more than 10-12 meter (40 feet)long and 6 meter (20 feet) high. This does however require sufficient distance between the scene and the viewer, which is all these gardens is enforced by the "sand-sea" in front. Where the location permits "borrowed scenery" (by means of Shakkei) has been skilfully used to frame in views of the surrounding hills that seamingly flow with the sculpted shrubs and hedges. All have relatively few and perfectly trained and clipped high evergreen trees. 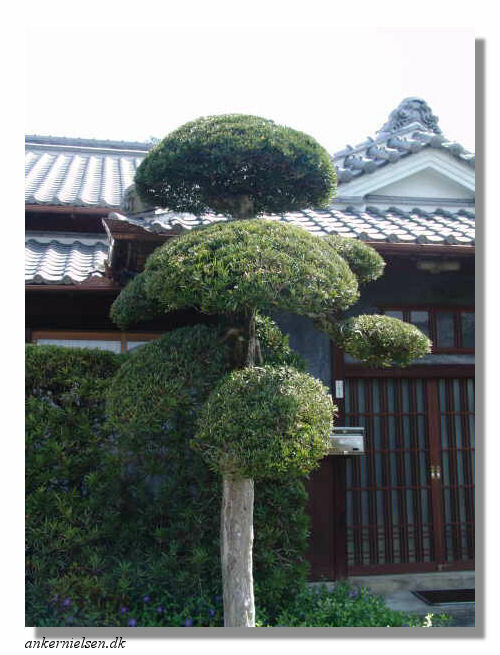 All of these have rather straight (chokukanshitate) trunks or slightly bendy trunks (kyokukanshitate) with the foliage on the branches in prunned in the so called step (danzukuri) shape , here representing floating clouds. And yet an other interesting observation of a distinguishing characteristic is the use of the hedges. Whereas most karesansui gardens have the classical wall as enclosure and as a background of the main stone setting, none of the samurai gardens uses such feature. They all have walls but not as part of the karesansui landscape scene as such. Instead they use high hedgerows or shrubs in the shape of O-karikomi as a transition between the garden and the outside world. If hedgerows are used in karesansui gardens this in many cases is (visually) on top of walls and always clearly separated from the landscape scene as such, whereas in the samurai gardens these form an integral part of it. This is much like used in important historical garden of Raikyu-ji in Takahashi and the Konch-in sub temple of Nanzen-ji in Kyoto. (for examples of Raikyu-ji see for instance the Karikomi and hako-zukuri topiary examples, Tsukiyama examples or Enclosures examples. Summarizing one could say that the gardens give a rather strong Chinese impression compared to most other gardens in Japan, perhaps more close to the gardens that the Zen priests must have seen on their pilgrimages to China. Almost unique is the use and the way in which, pagoda's (tou) and temple- or building-like stone lanterns are used, in addition to the more usual stone lanterns. What catches the eye even more is the placement of these pagoda's and "special" lanterns. In number 5, Sata Tamiko, the 3-store pagoda towers above the highest mountain-peak. We will get back to this in the next section. What is the origin and source ? Who built them ? Unfortunately we have not yet been able to track the builders. There are a number of sources that lead to Kyoto. Out of seven gardens six have a strong and prominent central stone setting with a high steep peak and relatively large pagoda's and lantern-like objects. 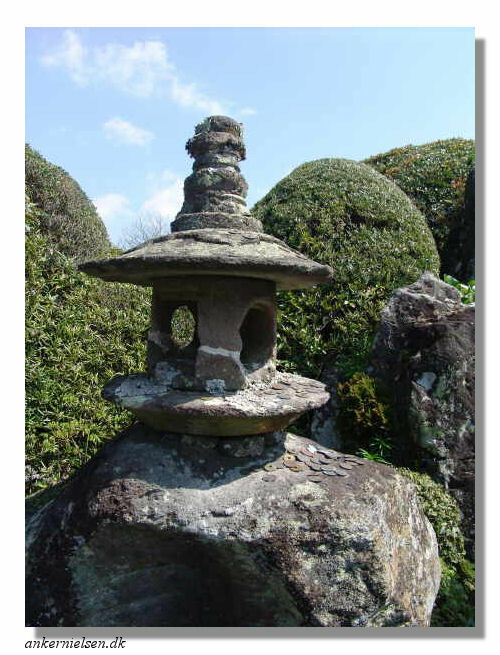 The latter are different from the ornamental stone lanterns that most gardens incorporate. Like all feudal lords in Japan, the Shimazu's were required to travel to Edo (now Tokyo) every two years. ...... the Shimazus employed the services of samurai retainers from Chiran. For such rural samurai these were the journeys of a lifetime, with exposure to the richeness of Kyoto and Edo......... It where these man that also invited gardeners to Chiran to construct a series of relatively small gardens on their modest estates surrounding the castle. (CBTH) It is believed that these Samurai residences were created during the reign of Shimadzu Hisatatsu (1651-1719) or Shimadzu Hisamine (1732-1772). The heads of the Chiran Shimadzu Family and their retainers were highly educated people and enjoyed Japanese waka poems and calligraphy. It is also said that they visited Kyoto and brought Kyoto culture back to Chiran. In addition, the Satsuma Clan introduced Chinese culture through trade with China by way of Ryukyu (present day Okinawa), which was indirectly under the control of the Satsuma Clan. One such influence can be seen in the gardens of the Chiran Samurai Residences. The gardens there are precious evidence that cause us to realize that Chinese gardening culture was introduced to Japan by way of Ryukyu. Note: One should know that in general is spoken of "three large waves of Chinese influence"  of Japanese culture. The last of these waves ended after the complete assimilation of Chinese values and forms, about an age after the collapse of the T'ang dynasty (630 - 838). The style of the seven gardens can be categorized as Mt. Penglai Stone Arrangement. 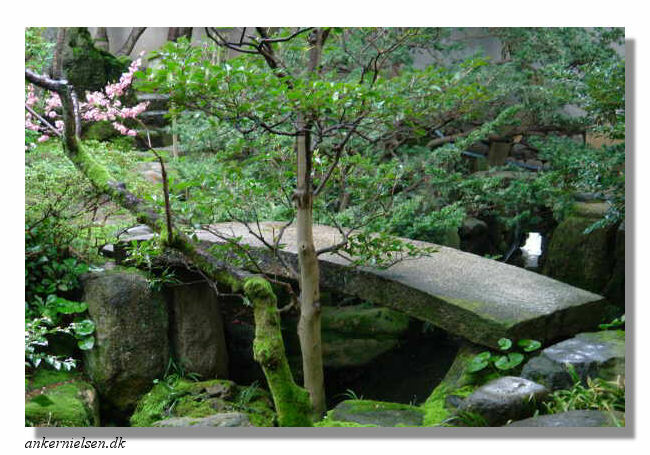 Japanese gardens have generally been influenced by Chinese and Okinawan gardens. Dry landscape can be found in many Zen temples. The "religious cosmology" that the Samurai of Chiran had in common those days, may have led them to get inspired by the same theme. Please also note the inclination of Japanese people toward conformity which can be traced back to the ancient and medieval age. The Samurai those days were living under the strong influence of ancient literature, art and philosophy. The gardens of Chiran have construction dates between 1741 and 1829. The garden has the air of ancient China and makes visitors feel as if they were standing in front of an exquisitely drawn Chinese ink painting. This is very true and we know of only few examples that come so realistically close to a 3-D projection of such ink-paintings. In Monochrome landscape ink painting examples you find a slide-show with some examples. Many examples involve a waterfall or cascade and some incorporate a pagoda, temple (-complex) or other building. Only very few have a pagoda as prominently positioned as seen in the Chiran-gardens. 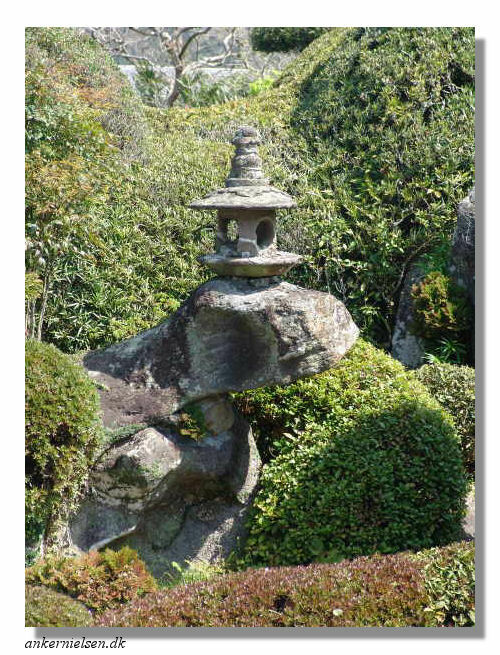 In the Japanese CBTH-pages (not in the English version of the website) of garden number 1, Saigo Keichiro, it is stated that the stone arrangement in the south-east corner forms a dry	waterfall and represents a mountain peak. The large rock and highest peak in the south-eastern corner of the garden is said to represent Mount Penglai. A keyword that pops-up only once, and only in the translation from Japanese, is Mount Penglai. In Japanese mythology this is Mount HÅ�rai ( è“¬èŽ± ) (Jp; Houraisan). According to Shan Hai Jing, the mountain is said to be on an island in the eastern end of Bohai Sea, along with four other islands where the immortals lived, called FÄ�ngzhÃ ng (æ–¹ä¸ˆ), YÃ­ngzhÅ�u (ç€›å·ž), DÃ iyÃº (å²±è¼¿), and YuÃ¡njiÄ�o (å“¡å¬Œ). Combining this with the above Mount Penglai "hint" reveals an interesting proposition. The Penglai Pagoda, also refered to as "Penglai Pavilion", when regarded the Pagoda on Mount Penglai (not well documented), is noted as one of the "Four Great Towers of China". Mount Penglai is located on the dividing line between the Yellow Sea and Bohai sea. The Pengly Pavilion is under control of Penglai city. There is a whole list of arguments in favour of the believe that what is represented in six of the seven gardens is a representation of Mount Penglai and the coastal area around its location. This however is no exact science and without evidence this is hard to prove, as there are many interpretations and manifestations that are all called the same, or just not have a name. It would be interesting to find out what was the fascination of the Samurai that set this "trend". We will now go through the arguments in favour of use of an ink-painting of Mount Penglai, one by one. "Just as Chiran was the little brother to Kogoshima, so each garden is an echo in miniature of the magnificent garden Iso Tei-en of the Shimazu that lies in the han capital itself". Comparing the samurai gardens with the Iso tei-en let us believe that there is no visible connection between the designs as such. Althoug the Iso tei-en will have been an inspiration and perhaps motivation, the origins must be very different. The gardens are all consciously constructed as fore-, middle- and background, and employed as three or more planes in the painting. In a number of gardens depth is being added by a stream or waterfall running from an "unknown" source in the background, through the middle layer to the foreground, at the bottom of the painting as if flowing toward the spectator. All this precisely in accordance with the Garden design) books. Highly differentiating are the prominently placed, mostly 3-store, pagoda's. The eye-catching placement is rather unique. The still existing Penglai Pagoda (also Penglai Pavilion) on top of Mount Penglai or Penglai Island in Shandong, China must have been seen by many, including the Zen priests on their pilgrimages to China. This could explain the dominant placement of the 3-store pagoda in number 5, Sata Tamiko, that towers even above the highest mountain-peak, as this would be the most realistic setting. It is noted as one of the Four Great Towers of China, although it is occasionally it is not listed due to its lack of a famous literary piece. Although this would be a good explanation for the "pagoda phenomenon", we also found this Puzhao Pagoda of Penglaige: Puzhao Pagoda of Penglaige, established in 1868, is located on the cliff at the northeast corner of Penglaige. This implies that it can not have been an example for the mid-18th century artists, painter or garden-maker. See a larger version of this Wikipedia photo. If there was a pagoda before this one was erected. Or if the other buildings already existed, as these to have towers and comparable rooftops. Or, if the pagoda's where placed about one age later, after it had been spotted. Of course the best prove would be to find or identify the ink-paintings that where used. An other option being that this has been only visualized in the creators mind, who may have seen the scenario with his own eyes. On the other hand this may be less important. There are landscape scenes, mostly South China, and paintings based on them that date back to well before 1868. In the examples we found, included in the examples slide-show, there are a number of scenes that come very close tho the Penglai Mounten Pavillion, that could also have been of inspiration. To name a few, the paintings by: Gyokusen Osanobu, Kei Shokei, a whole range of paintings by Ike no Taiga (1723-1776) who lived in the period that these gardens were layed-out and Kano Sansetsu, also known as Kano Heishiro, who lived well before that time and was born in Hizen Province on Kyushu. Perhaps the most interesting resemblance is seen in the painting by Shugetsu Tokan (1427?ca. 1510), Smithsonian Institution. This is a panoramic landscape of the Yangzi River in China. This handscroll of scenery along the Yangzi River is one of two known paintings by Shugetsu that record actual sites in China. The other, in a Japanese collection, is dated 1496, possibly the artist was in China at that time and painted this handscroll during that journey. Written above each site in this pictorial record of the artist's travels is the name of the place. More than other paintings of China by Japanese artists, who rarely had an opportunity to travel there, this painting seems to document actual locations visited by the artist, though the depictions probably contain idealized scenery as well. Shugetsu was a disciple of Sesshu, and is said to have accompanied his master to China. 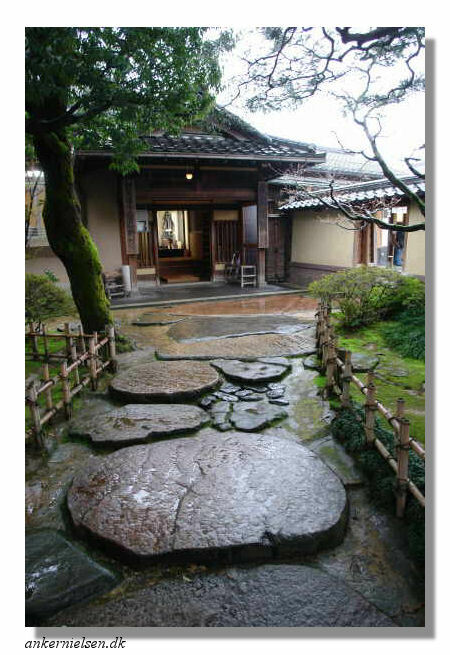 The qualities of and the way how stones are used shows resemblance to the Chinise gardens that the Zen priests must have seen on their pilgrimages to China. In particular the exceptional gardens of Hangzhou. And actually not only the gardens but also the nature and partly man-made scenery around the Song-capital. Note: The Southern Song scroll "Eight Views of the Xiao and Xian" by the 13th century priest painter Mu Xi(Mu Ch'i) was imported to Japan and sealed by shogun Yoshimitsu. Mount Penglai is located along the coast. All the gardens have a coastline as an inextricable property of their design. 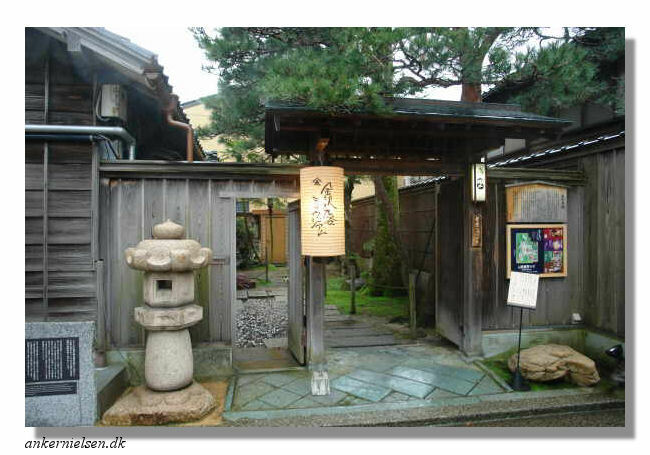 The use of "normal" Ishi-dori (stone lantern) compared to the use of "special" lanterns. 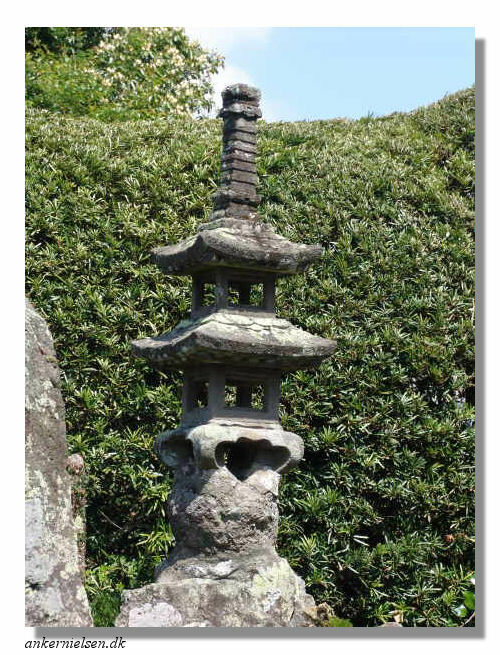 Stone lanterns are used in most gardens. Always in the first (closest) layer of the painting. These are the type of lantern that normally light a garden and are used to enhance the forground, 1-st tier. The lantarns that can be found scaterred across the landscapes, have close resemblance to 1-store pagoda's and/or huising contructs like temple buildings. In line with that hypothesis these 1-store pagoda's are, in all gardens, part of the second plane or middle tier [1, p272]. Cranes and turtles 17 are always associated with the Chinese HÅ�rai legend [1, p224]. At least one garden has these objects, as stated on the CBTH-pages related to garden number 1, Saigo Keichiro. The strangely formed mountain peaks are very Chinese and very Penglai like. From JAANUS houraiseki: Of the many Muromachi and early Edo period houraiseki most have a distinctly aged appearance and are pyramidal in shape, suggesting Mt. Penglai as it is often depicted in painting. 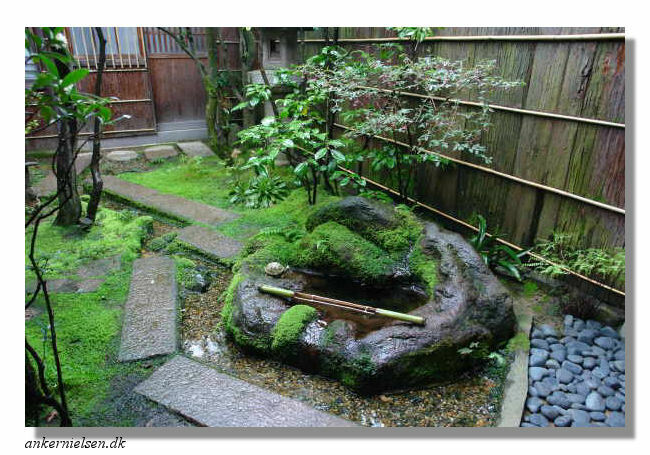 In Kyoto we find a number of gardens that are in the "style" as discussed, and could have served as an example or inspiration for the Chiran-gardens. The use of massive stones rising over 3 meters height, to represent a mountainside according to the Song height-distance perspective with optionally a waterfall cascading down mostly on the right side (from the viewer) [1, p110]. Some of the most famous examples that all date back to well before the construction of the Chiran-gardens are the Daisen-in and Korin-in subtembles of Daitoku-ji, Zuiho-in, the southern garden of the Hojo in Tofuku-ji and others. From the above it is safe to conclude that a representation of Mount Penglai is the most obvious and plausable. In Japanese mythology this is Mount HÅ�rai ( è“¬èŽ± ) (Jp; Houraisan. A variety of manifestations can be seen in many gardens. This does however not explain for the pagoda "phenomenon", both the large 3-store and 1-store versions. What drawing or ink-painting has been used ? Was the same ink-painting used as an inspiration for all gardens ? Where they all build by the same "garden maker" ? It is also said that they visited Kyoto and brought Kyoto culture back to Chiran. In addition, the Satsuma Clan introduced Chinese culture through trade with China by way of Ryukyu (present day Okinawa), which was indirectly under the control of the Satsuma Clan. One such influence can be seen in the gardens of the Chiran Samurai Residences. The gardens there are precious evidence that cause us to realize that Chinese gardening culture was introduced to Japan by way of Ryukyu. Unfortunately we have very little documentary evidence handed down which shows who built the gardens. We only know that the town planning was accomplished around 1750 under the reign of Shimazu Hisamine(1732-1772), the Lord of Chiran. Presumably, the gardens were created around that year and afterwards, but nobody knows the concrete names of the gardeners. There's only a saying that gardeners were called from Kyoto or Kagoshima to design the gardens. This slide show shows a collection landscape ink-paintings with mountains and pagoda's, tempels and other buildings, that could have influenced the Chiran-gardens. Note: This list of examples is work in progress. For a collection of more "common" landscape ink-painting examples see: Monochrome landscape ink painting examples. The Museum of Chiran exhibits scrolls and pieces of lacquer ware, fabricated during the Edo Era, in an excellent state of preservation. You will be surprised to find the pictures depicted on the surface of the works are strikingly similar to the theme used in the gardens. One remarkable feature that sets our gardens apart from other notable gardens in Kyoto, Kanazawa, Nikko etc, is that direct descendants of the Samurai are still living in these Samurai houses and preserve their gardens themselves. We have not been able to determine the dates that these gardens where laid-out. This however is no longer relevant as we can safely conclude that these samurai gardens are very different from those in Chiran. Hence there is no need to pursue their origins as that will not be very helpful in finding the roots of the Chiran-gardens. The Koseki Samurai Residence in Shiroishi has a garden that is rather simple and not easy to typify. This garden shows no resemblance to the Chiran-garden landscape scenes. 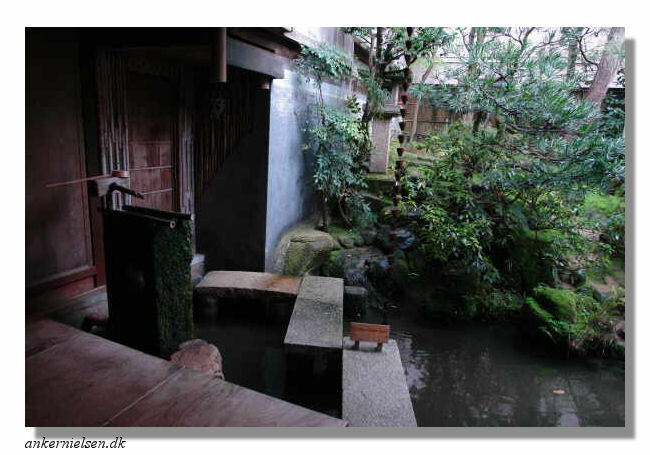 If we needed to typify it, then we would call it a residential garden (Buke(-zukuri) ) with some Tea garden elements. Of the three samurai gardens found outside Chiran this, Nomura Samurai Family Residence, is the most beautiful. It shows however little or no resemblance with the Chiran-garden landscape scenes. If we need to typify it, then it would be, or at least be in the style of, a Tea garden. We do not know why this is called "Takada Family Remains". 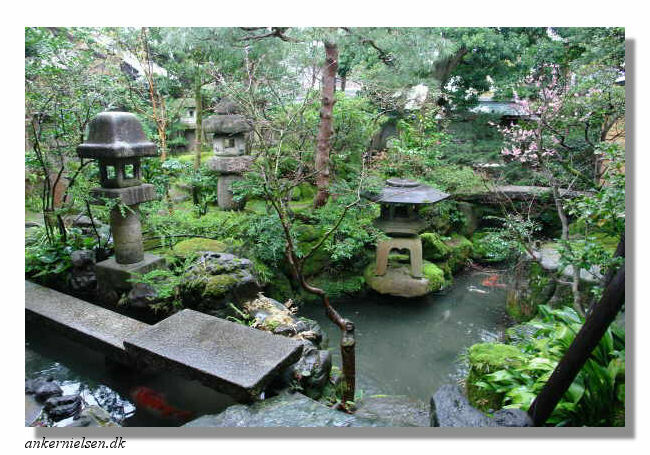 At least the garden looks likea complete garden that typifies as a small residential garden (Buke(-zukuri)). Like the others outside of Chiran this garden has no real resemblance to the Chiran-garden scenes. Like the others outside of Chiran these garden have no real resemblance to the gardens of Chiran. And again, no gardens to be compared with these of Chiran. Zen stories of the Samurai, with a chapter about characters including Sen no Rikyu 3. Samurai: The World of the Warrior [D].